What’s astonishing about this chart is that even the blue line–representing household debt–is abnormally steep. The line represents growth in household debt inclusive of the period between 1999 and 2008, when household debt tripled due to the housing bubble. 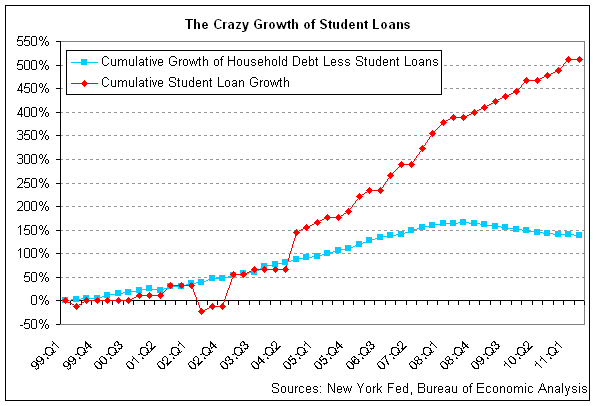 But compared to the red line–student debt–household debt has been rather tame! What does this all mean? The Atlantic argues that student debt will cause a period of low economic growth, as new entrants to the labor force end up repaying student loans instead of buying goods and services. Study FRBNY’s sources on their web site. They buy data from one credit bureau. The credit bureau depends blindly on each creditor’s definitions of repayment, delinquency, deferment, default, etc. As a result, FRBNY’s data omits a lot of the outstanding federal student loan (DL and FFEL) debt. The regs only requre FFEL holders to report to one of the national credit bureaus — not all of them. While some voluntarily report to all of them, others only report to one. As FRBNY buys data from one national credit bureau, a lot of education loans are missed. A side effect is that FRBNY’s education loan universe is skewed toward private label (non-federally-guaranteed) education loans. FRBNY also notes a significant change during the past few years on whether its source credit bureau reported loans in deferment at all. Trends in FRBNY’s data more likely relate to idiosyncrasies in loan holder and credit bureau reporting than actual, “secular” economic trends. More specifically, as Direct Loan reports to all the national credit bureaus, the ongoing transition to full-scale direct lending (all new loans since 6/30/10 are DLs) will greatly exaggerate the “increase” that The Atlantic and WSJ are noticing. Finally, consider 2008 onward. In late 2008 high levels of emergency loan sales from FFEL lenders to DoEd began. Just as with the Direct Loans, DoEd reports servicing data on the purchased FFELs to all of the national credit bureaus, not just one. The combination of the new data channel (DoEd-serviced FFELs) and the legislative transition (to full-scale direct lending) are “black swan events” that The Atlantic has either ignored or is unaware of.